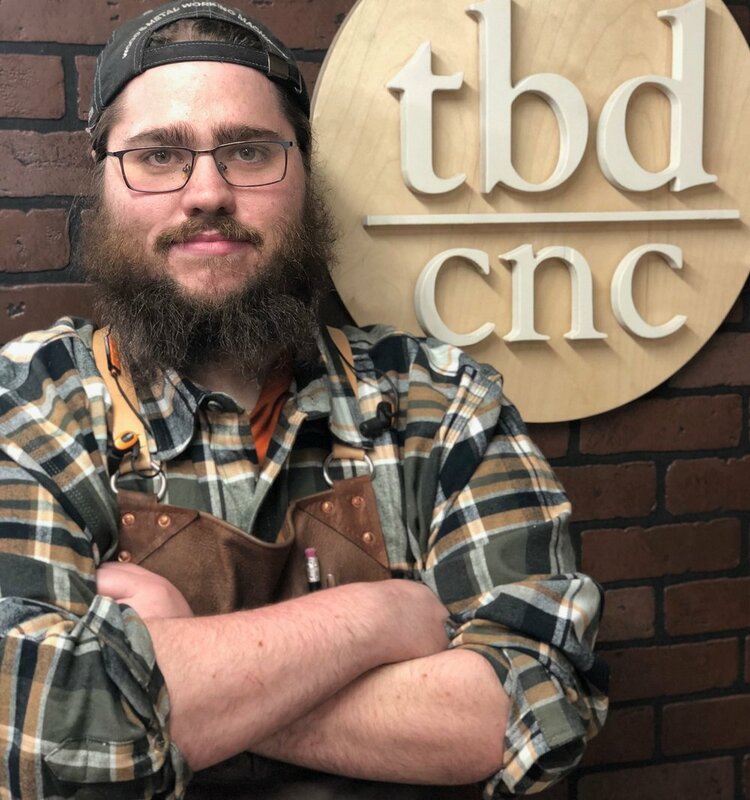 Meet the tbd cnc team! Luke is the head honcho of tbd cnc. He designs, creates, and produces all the pieces we make. After his day job as an industrial engineer, he comes home to work on this business. When he isn’t working in the shop or at his day job, Luke enjoys jet baths, drinking beer, riding his electric bike, and watching woodworking YouTube channels. Katelyn is in charge of social media, packaging, and quality. She packages most of our orders and includes custom notes for fun. She also makes sure the shop fridge is stocked with fun, new beers she brings back from around the country, which is why we keep her around. When she isn’t working at tbd, she spends most of her time working and traveling for her real job, playing with the pups, and watching movies. Ruby is our chief security officer and shop apprentice. As chief security officer, Ruby alerts the team when danger lurks and scares away any threats, like the wind or dad coming up the stairs. Ruby has been working on her woodcarving skills as part of her apprenticeship but to the rest of us it just looks like she is chewing the wood into small pieces to leave as messy piles around the house. When Ruby isn’t fulfilling her tbd cnc duties, she prefers long cuddles on the couch, playing with her sisters, and talking back to her parents. Della Mae is our shop supervisor. She spends most of her shifts laying in her bed or stuck in a chair, but if you asked her, she’d say she is overseeing shop operations. She is paid in cuddles and receives bonuses via chicken nuggets. When Della isn’t fulfilling her woodshop duties, she enjoys playing with the neighbors and jumping the fence to go on adventures (but she tries to fool her Ma and Pa by sneakily climbing right back over the fence when called to come inside). She also thinks tbd stands for “the best dog” because her daddy calls her the best dog ever. Mila keeps showing up at tbd but no one knows what she does. She is the coworker who microwaves smelly food in the break room, talks too loud on the phone, and clips her nails in the office. When Mila isn’t “working” she enjoys eating snacks, stealing food, and growling at her sisters. If you ever visit the shop, we suggest steering clear of Mila. She has quite the temper.